Jim Denley was born in Bulli, Australia in January 1957. Wind instruments and electronics are core elements of his musical output. 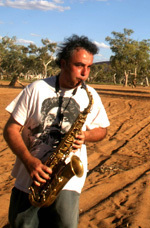 He has played throughout Australia, Europe, Japan and the US with artists such as Chris Abrahams, Clare Cooper, Keith Rowe, Joel Stern, Robbie Avenaim, Jon Rose, John Butcher, Otomo Yoshide, Fred Frith, Phil Niblock, Trey Spruance, Clayton Thomas, Tess de Quincy, Axel Doerner, Adam Sussman, Ami Yoshida, Oren Ambarchi, Tony Buck, Ikue Mori, Satchiko M, Malcolm Goldstein and Annette Krebs. With MURAL, (Kim Myhr and Ingar Zach) he will play at the Rothko Chapel in Houston in March 2010. 'This is music at it's most primal, enhancing the beauty of creation.' (John Shand - Sydney Morning Herald).